An attendee talks during a conversation on community violence hosted at the Play Nice LBC vintage sporting goods boutique in Alamitos Beach on Wednesday, April 3, 2019. The event was in response to the murder of rapper Nipsey Hussle. Photo by Stephanie Rivera. Usually, Ryan Hoyle doesn’t attend vigils unless they are for family, but earlier this week he made an exception when he joined Nipsey Hussle fans to mourn the rapper who was gunned down Sunday in South Los Angeles. “I felt like I knew him,” said the 26-year-old Long Beach resident and longtime fan. On Wednesday night, Hoyle brought the pain he and many friends felt for a man who meant so much to them to Alamitos Beach where he co-owns the vintage sporting goods boutique Play Nice LBC, which also serves as an art gallery and community space. In an ironic twist, Hussle was the inspiration behind Hoyle’s contribution to the business, the art and community part, Hoyle said. 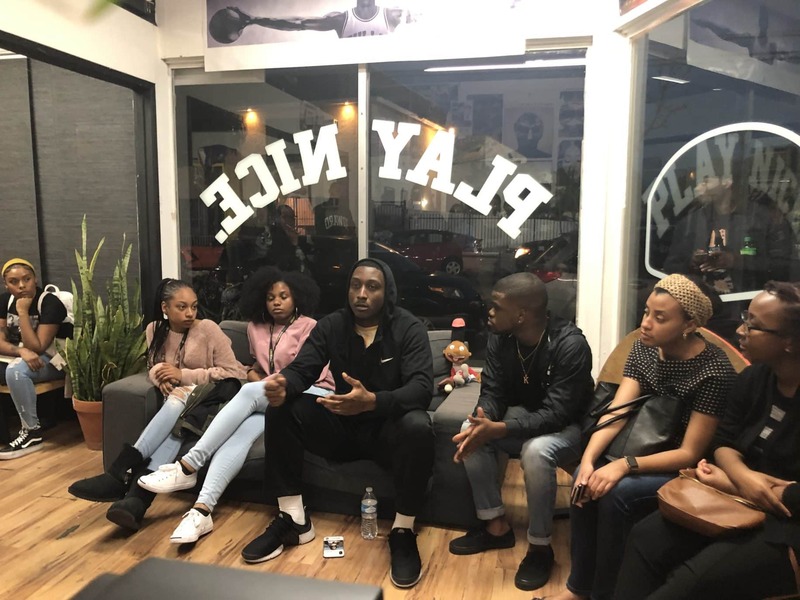 Ryan Hoyle, 26, lays down the rules for a conversation on community violence he hosted at Play Nice LBC on Wednesday, April 3, 2019. Hoyle co-owns the vintage sports good boutique and handles the art gallery and community space aspect of it. Photo by Stephanie Rivera. “I thought, ‘Wow, this is my chance to get an actual stake in the community’,” said the Cal State Long Beach graduate who recently earned a master’s degree in social work from Loyola Marymount University. Since the business opened last May, Hoyle has hosted a voter registration drive and a financial literacy event. This time the focus was a conversation on community violence. Hussle was not only a rapper, but a community leader who invested in the poor, violence-ridden community that raised him through economic development, housing and education. He was also a former gang member who stressed unity. 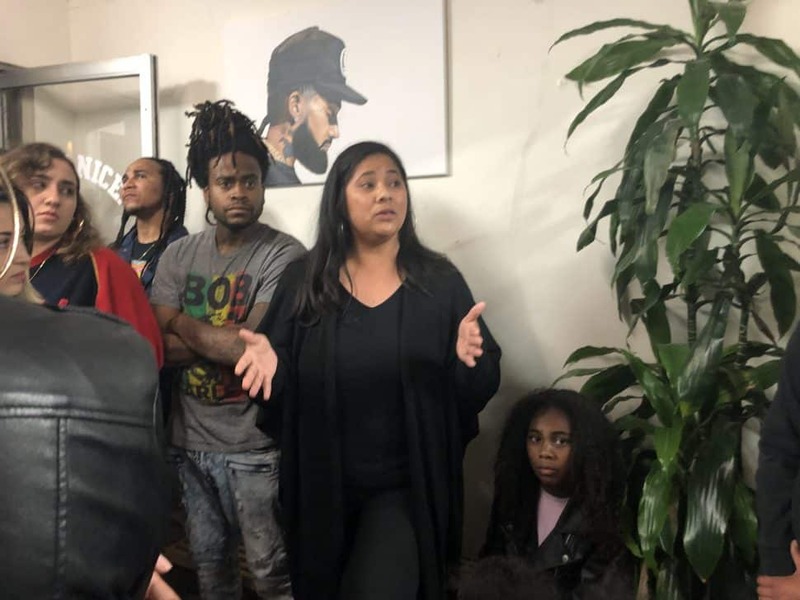 “He gave people knowledge and wisdom,” said Long Beach artist Adrienne “Dri” Reynoso, who brought in a portrait of Hussle she painted recently to hang on one of the store’s walls. A woman, accompanied by her young daughter (seated), talks about her community activism following the murder of her husband. 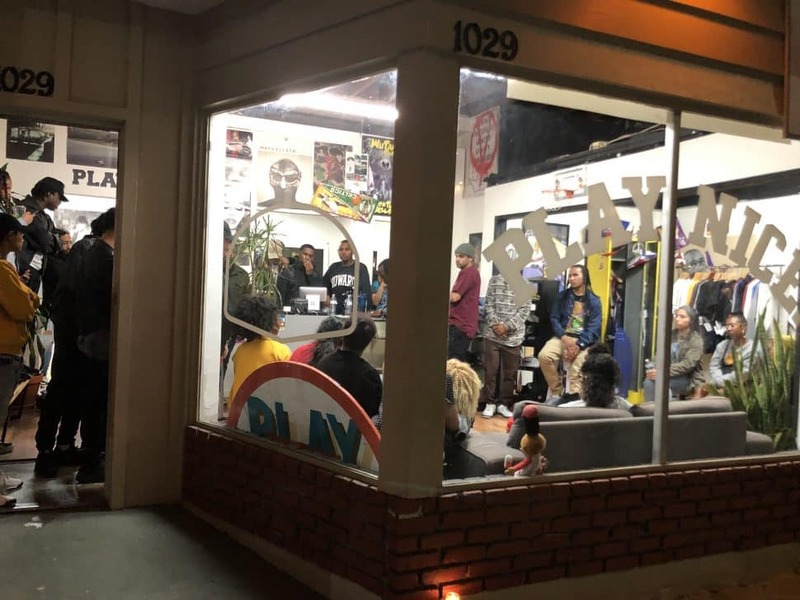 The gathering on Wednesday, April 3, 2019 was hosted by Play Nice LBC in Alamitos Beach in response to the fatal shooting of rapper Nipsey Hussle. Photo by Stephanie Rivera. The mostly 20-something-year-olds who packed the Fourth Street store seemed to agree. For one man, Hussle’s words led him to a library to find out what they meant, something he had only done before with the rappers Nas and Tupac. While many debated an online opinion that Hussle’s mistake was “staying in the ghetto,” the overall consensus was that it was part of his ministry as a trailblazer. “For him it was a testament to die in the hood because at the end he was still in the hood,” one young man said. “It’s easier to leave a messy house behind than fix the mess,” another man added. 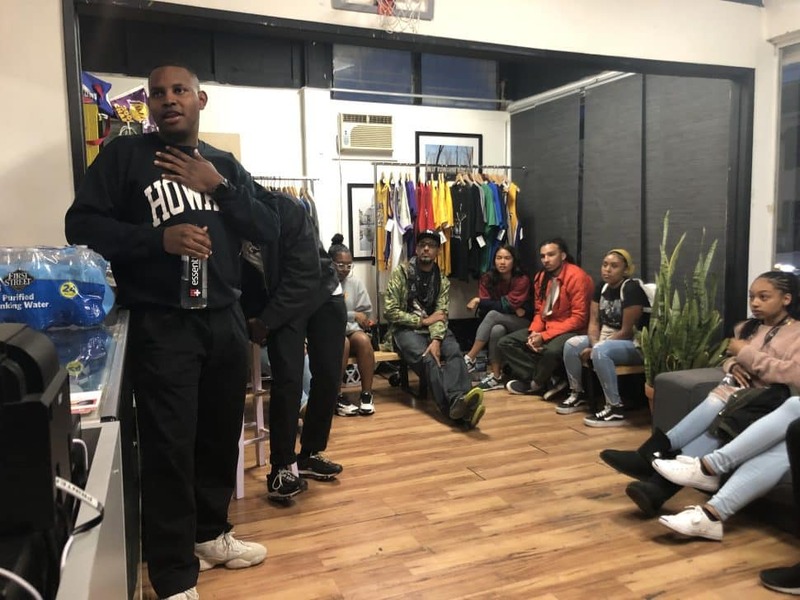 Play Nice LBC, a vintage sporting goods boutique in Alamitos Beach, hosted a conversation on community violence on Wednesday, April 3, 2019 in response to the fatal shooting of rapper Nipsey Hussle. Photo by Stephanie Rivera. As the night progressed, passing the two-hour mark, a young man visiting from the Bay Area thanked the crowd for the conversation, noting the fact that there was no alcohol or other amenities keeping them there. “The passion is evident,’ the Richmond resident said.